Mile-High Wi-Fi Showdown: Which Airline's the Fastest? Many airlines offer in-flight wi-fi and though you might not choose flights based on download speeds, it helps to know what to expect from each carrier. With your help, we conducted our first Mile-High Wi-Fi Test. Delta Airlines won. We've tested 3G data speeds in the past, so as in-flight wi-fi became more widely offered we decided that its performance needed to be rated as well. We asked readers to use Speedtest.net when they traveled—checking upload and download bandwidth along with ping latency, reporting the numbers back to us along with a goofy self-portrait, a la Brian Lam. We logged the speed test results along with the airline and the flight route. Our first round of testing accounts for December 2009 and January 2010. Have You Joined Gizmodo&apos;s Mile High Club Yet? So, overall Delta Airlines handily outperformed the rest, but again, this is just round 1. Besides, it seems worth noting that despite differences in broadband speeds, all four of those airlines use GoGo in-flight Internet to provide the wi-fi service. We call this the first round because we're far from done. 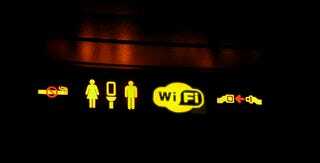 We want to keep collecting data on in-flight wi-fi and keep getting better and better results. The more data points we have, the better reporting we can deliver on the state of in-air wi-fi.